the papers that Bob Beck would pass out at his lectures. Application of a direct-current electrical field for very short times can serve as a practical nonthermal procedure to reduce or modify the microbial distribution in gel beads. The viability of Escherichia coli and Serratia marcescens entrapped in alginate and agarose beads decreases as the field intensity and duration of electrical field increase. Effect of weak electric current on reducing oral bacteria in vitro. The ions generated by weak electric current may be used for removal of dental plaque. Also, it has been judged from changes in the viable bacterial cell count and the amount of adenosine triphosphate (ATP) in the saliva that the passage of such a current also has a bactericidal effect on the oral microflora. We confirmed in vitro that 0.5 and 1.0 mA currents that passed for 10 min through phosphate buffered saline containing salivary bacteria were effective in killing the bacteria. A method and apparatus for destroying blood borne pathogens is disclosed which utilizes a low intensity direct current to generate positive particles from various metals which destroy viral pathogens. A first electrode comprised of a metal such as silver is inserted into a patient's venous system. Then, a second electrode is placed on the patient's exterior in the vicinity of the first electrode. A low intensity direct current is applied to the first metal electrode which releases silver cations to be bonded to the virus, resulting in the denaturing of the virus. The first electrode is placed in the venous system of the infected patient via a catheter. In the 1991 March 30th issue of Science News research from the Albert Einstein College of Medicine appeared utilizing microamperes of electricity. Dr. William D. Lyman and Dr. Steven Kaali had presented a paper in Washington, D.C. on March 14th at the First International Symposium on Combination Therapies. In their laboratory, electrical currents disabled or neutralized viruses so the viruses were no longer able to reproduce. The research spoke of the possibility of running blood through a dialysisâ€“like unit or implanting electrical devices to incapacitate HIV. Robert C. Beck (after retiring from a rewarding career as a physicist) was both intrigued and challenged by this new science. His first discovery was that the research had been pulled from public viewâ€”the paper was no longer part of the published proceedings of the symposium. The researchers did fill patent #5,188,738 on November 16, 1990. 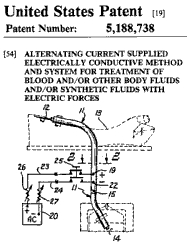 The patent states: â€œto provide electric current flow through the blood or other body fluids at a magnitude that is biologically compatible but is sufficient to render the bacteria, virus, parasites and/or fungus ineffective to infect or affect normally healthy cellsâ€¦â€� here Dr Beck explains the patent. The only other public evidence of this research is an interview with Dr. Lyman on March 30, 1991 by the CBC radio program â€œQuirks & Quarksâ€� in Canada. Robert C. Beck set about to develop a system to send the necessary microcurrents of electricity into the blood without medical intrusion or, in other words, without invading the body. After developing a system using electrodes placed over two arteries allowing the current to flow in a closed loop within the arm. he funded a study with two medical doctors and 8 AIDS patients According to Bob Beck, all 8 patients were symptomâ€“free. He didn't publish the results of this study as the medical system, required an PCR test showing that each individual was no longer HIV positive. This led to confusion and the eventual abandonment of the study as the PCR test results were all over the place. It has since come to light that the PCR test is not a valid test for HIV. Over time, Bob Beck saw the need to reach the lymphatic system with electrification. He realized the lymph system is more extensive than the blood vessels and can harbor and hide viral infections and so re-infect the blood. To electrify lymph and tissue, Beck devised a magnetic pulse generator to induce the necessary microcurrents of electricity in specific sites. Beckâ€™s research also uncovered much historical evidence about the effectiveness of ionic/colloidal silver as a natural antibiotic. Again he applied his inventive genius and developed a simple device to allow individuals in their homes to make their own ionic/colloidal silver. â€œFour o'clock one morning three years ago, I woke up with a perfect solution on how to make it. I put it on an old nine-volt transistor radio battery and a couple of silver wires. Dunk those wires in water â€¦â€� See HOW TO MAKE IONIC/COLLOIDAL SILVER for procedures to make 3â€“5 PPM ionic/colloidal silver with a small particle size. the units his endorsement. He had only endorsed one other company to this point, as he wanted to be sure the public would get good value for their money. Russ Torlage of SOTA worked closely with Bob Beck for the last few years of his life. At the time of his passing, SOTA Instruments Inc. was the sole company endorsed by Robert C. Beck. Dr Bob Beck video - lecture on curing cancer and HIV with microcurrents! What is a Blood Cleaner Device? The Research of Dr. Robert (Bob) C. Beck, D.Sc. What is "The Magnetic Pulser"?